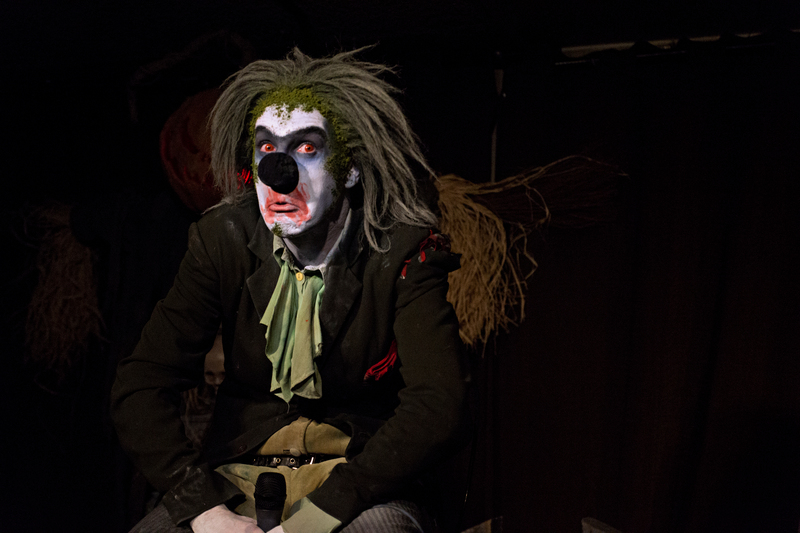 Everyone’s favourite vegan zombie clown Jean-Paul Mullét (aka Mullet) is back at it again at Toronto Fringe, this time in the spooktacular Mullet’s Ghost Story. Written by Ron Fromstein, Allan Turner, Bruce Hunter and Hilary Jane Hart, and directed by Bruce Hunter, the show is currently running upstairs at Harbord House. This tale finds Mullet as a struggling actor/waiter with a mean boss and ineffectual agent, toiling away upstairs at Harbord House and late for his shift. And as if that’s not scary enough, Mullet takes some time away from his serving duties and sharing personal anecdotes to produce a thick, dusty old book containing some very special ghost stories. Adding to the fun: the ghost stories get personal with the appearance of a lovely someone from Mullet’s past (Hilary June Hart). Possession! Sharks! Ghost stories! Plus a charming and entertaining host with loads of LOLs and scary good fun up his sleeve in Mullet’s Ghost Story. Mullet’s Ghost Story continues at Harbord House until July 10. For ticket info and advance tickets/passes, check out the Fringe website.